Guildford is a large town in Surrey, situated 27 miles to the southwest of central London. Due to recent building development north from Guildford, the town now officially forms the south-western tip of the Greater London Built-up Area. 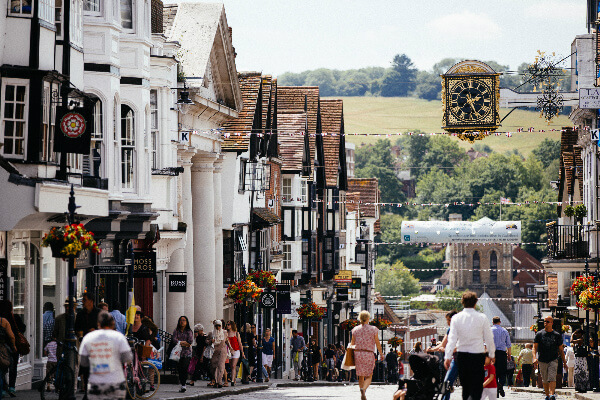 Guildford has Saxon roots and many attractions of historical interest, as well as enchanting views of the North Downs. Guildford is Surrey’s most vibrant town and property prices are at a premium. If you are short of room a loft conversion may well be your best answer, as it saves the hassle and expense of moving Whether you need another bedroom, a home office or even a quiet room to relax, a loft conversion likely to be the cheapest option, and at the same time will add significant value to your home. Why Choose Touchstone To Convert A Guildford Loft? Touchstone Lofts are nearly always working in Guildford. We are probably working on a loft conversion in Guildford as you read this. For this reason we have extensive experience in Planning permission in Guildford as we have done many successful planning applications for our previous customers. We convert lofts in the following postcodes: GU1, GU2, GU3 and GU4. Touchstone Lofts is the premier loft conversion company in Guildford having converted so many lofts in the town, and extremely competent at making usable living space out of even the smallest attic. When using Touchstone to carry out your conversion you can be sure you are in safe hands and your job will be done by a specialist loft conversion company that only does loft conversions as opposed to a general builder. Whether you need a bedroom, a study, a gym, cinema or living room, we create your will create a dream space while you can relax. When choosing a loft conversion company – make sure your choice is a reputable loft conversion specialist with decades of experience – Touchstone Lofts – FMB 2010 Winners for highly commended customer service. So ring us or fill out our contact form today for your FREE, no obligation loft conversion feasibility study.